The South Mountains are an isolated, majestic and rugged mountain range, arising from the gently rolling Foothills and upper Piedmont region of western North Carolina. These mountains encompass 100,000 acres in Burke, Cleveland and Rutherford counties. 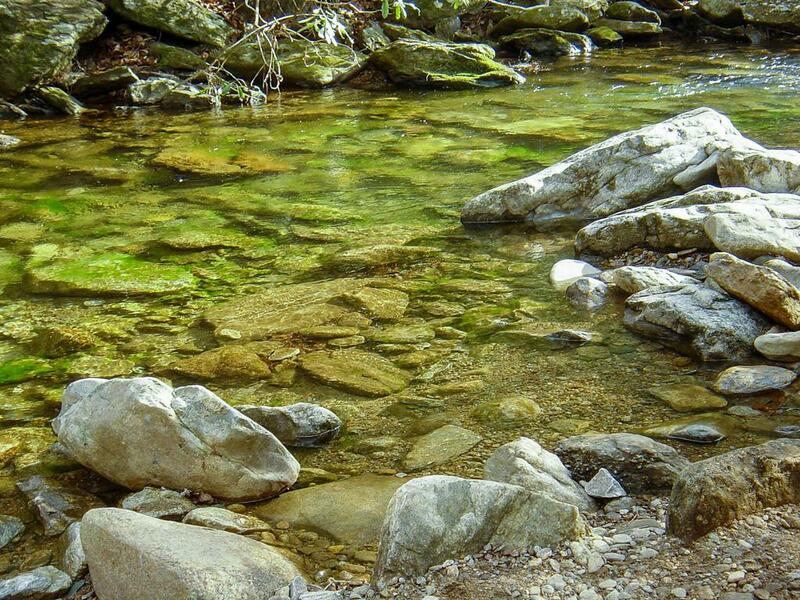 Crystal clear water in the Jacob Fork river beside the picnic area in South Mountains State Park. It takes plenty of climbing via staircases like this one to reach High Shoals Falls. Carved out of the Blue Ridge by erosion, the mountains are actually considered to be in a different geologic belt than their nearby, much larger cousins. The South Mountains formed as a result of more erosion resistant rock interspersed with the normal Piedmont rock types. You'll find a belt of peaks and knobs, with deep valleys in between. 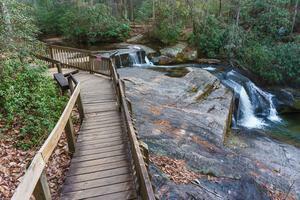 The most popular destination within the park, for good reason, is High Shoals Falls. 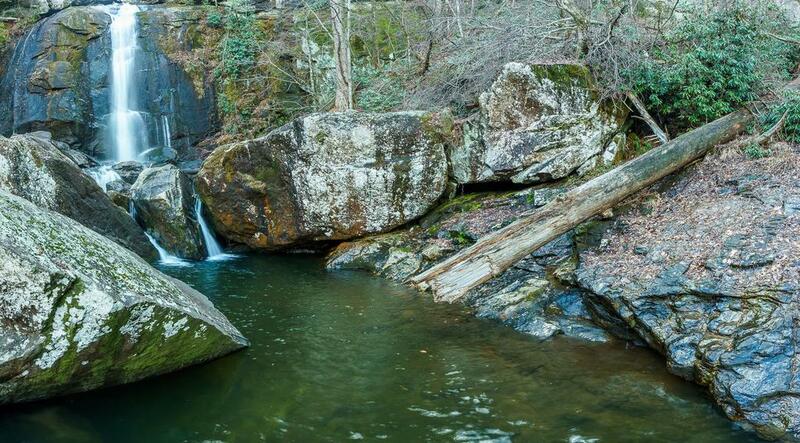 The small Jacob Fork River plunges over 80 feet of rugged, sheer rock into a beautiful, blue-green pool, continuing through a steep boulder-filled gorge over numbers smaller chutes and cascades. If you plan to visit just one destination within the park, this should be it. 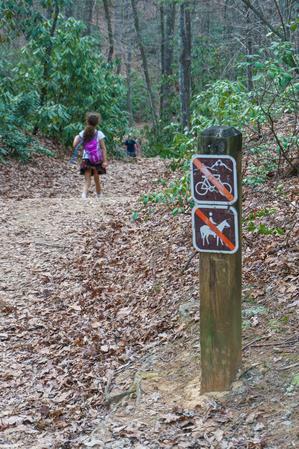 The High Shoals Falls Loop trail takes you to the falls and receives far and away the most use of all trails in the park. 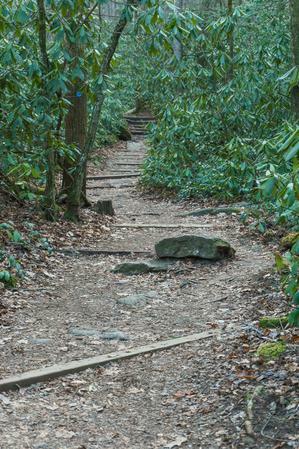 But vast areas of the park are much less frequently visited, accessible via trails such as Chestnut Knob, Upper Falls, and Raven Rock. 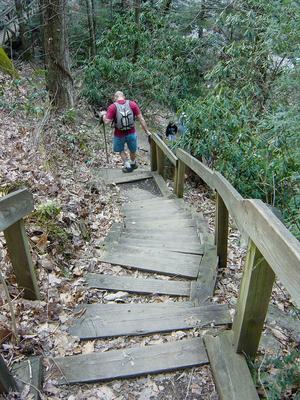 The overlooks on Chestnut Knob, while requiring some effort to reach, offer probably the second-most visited areas with the view back down toward High Shoals Falls. This is just an overview of the trails available in the area. For a full list of trails within the park, see the South Mountains State Park Trails Page. 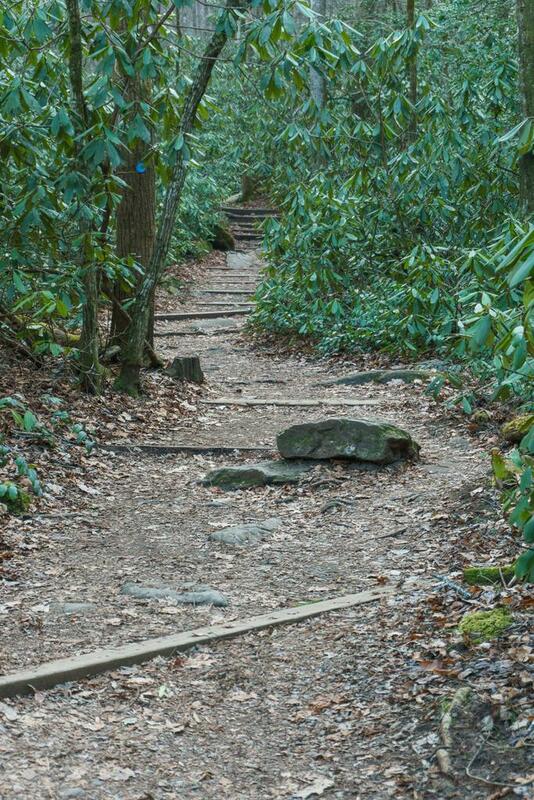 The mountains themselves served as a buffer between different groups of Native Americans - the Cherokee and Catawba. The South Mountains lie just south of the Catawba Valley, which has always been a major travel route. In fact, today, Interstate 40 follows the Catawba River closely in this area, attesting to its importance in transportation. Early European settlers farmed the fertile land along the Catawba river, likely venturing into the mountains for hunting - and, eventually, for mining. In 1828, gold was discovered in the area, which attracted a minor gold rush. Gold was mined all the way up until the early 20th century, but eventually, activity in this area declined. Development within what is now South Mountains State Park began with Camp Dryer, a Civilian Conservation Corps camp, located at Enola. 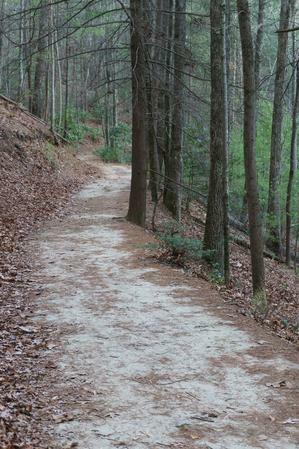 Several forest service roads still in use today were constructed by workers with the CCC. Proposals for a state park began in the 1940's, with funds for purchasing the land becoming available by 1974. The first tract purchased totaled 5,774 acres, with the Park's present size at over 16,000 acres. Little other development has occurred within the area of the park, aside from most areas having been logged. 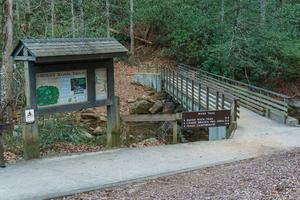 Most of the park's amenities can be reached from main entrance to the park on S. Mountain Park Road. Here, you'll find the equestrian center, the campground, picnic area, main parking area, park office, restrooms, and trailhead for some of the best excursions into the mountains. 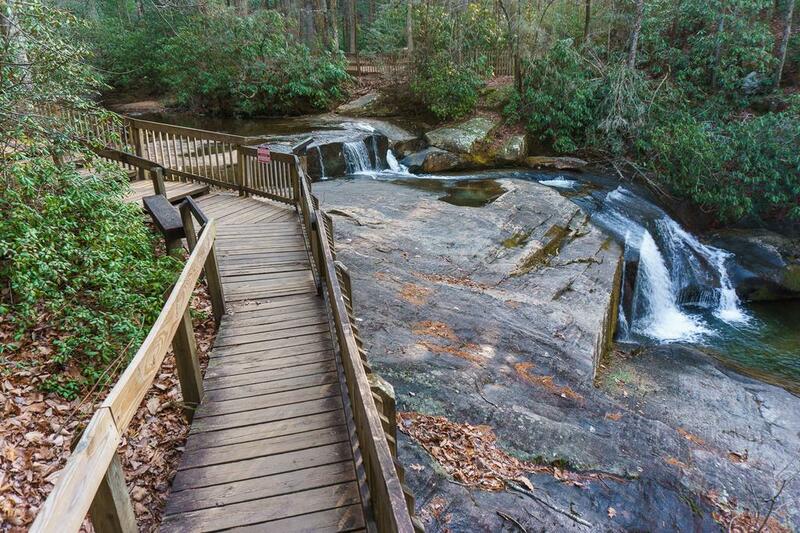 The primitive family campground is located 1/2 mile past the park entrance, near the crystal-clear river. There are eleven campsites, each with tent pad, picnic table and fire ring. Unreserved campsites are available on a first-come, first-served basis. When you arrive, occupy an empty/unreserved site, and a ranger will come by to register you that evening. 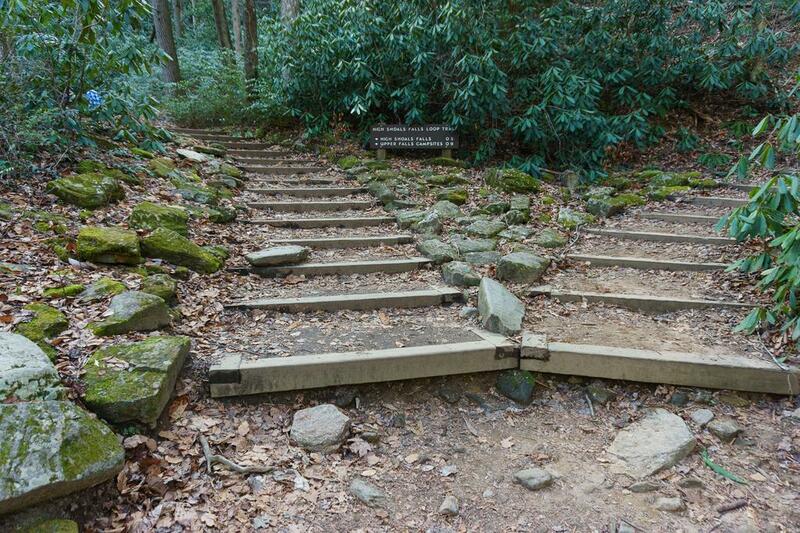 Alternatively, you can make a reservation by visiting the NC Parks Reservations Page. Pit toilets are available at the campground. Cost is $12/site per night. 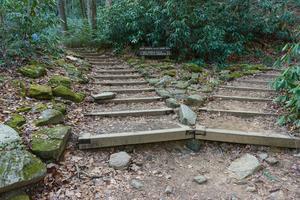 There are 20 primitive, backcountry group campsites available within the park as well. Reservations are required, and sites can be reserved by organized groups only. The cost is $12/site per night. Contact the park for more information. 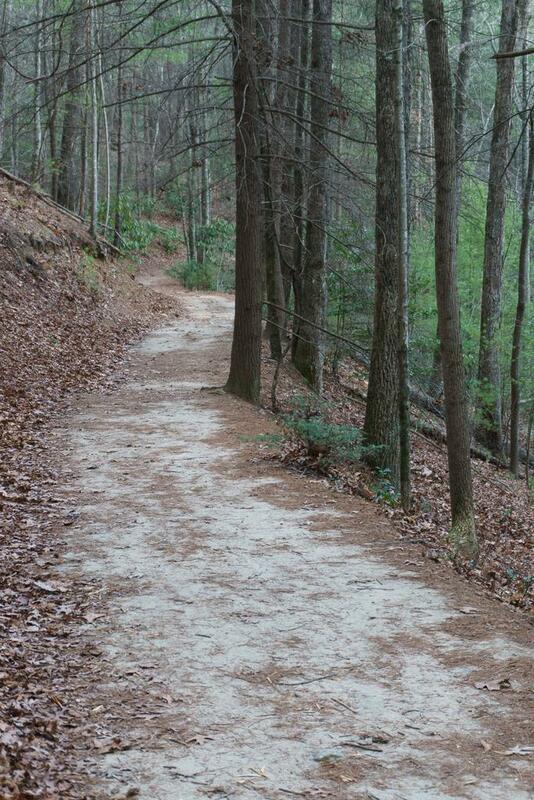 Lodging is available in the nearby towns of Hickory and Morganton. The plunge pool below High Shoals Falls on a warm day in February. The main entrance to South Mountains State Park is located at the end of South Mountains Park Avenue off old NC 18 in Burke County. From I-40 east or west and points north, take NC 18 (exit 105) south for just over 11 miles. Turn right on Sugar Loaf Road and go 4.2 miles. Turn left on Old NC 18 and go 2.7 miles, then turn right on Ward's Gap Road and go 1.4 miles to the Jacob Fork River bridge. Bear right on S. Mountains Park Avenue. It is 1 mile from there to the park gate, and another 2.4 miles to the parking at the picnic area.